QV's property index found values down 5.3% from November 2007 peak and down 1.4% from March this year, but up 2.0% from this time last year. Government owned valuation service Quotable Value has reported that property values in the three months to September were down 5.3% from the November 2007 peak and down 1.4% from March this year, but up 2.0% from this time last year. Property values across New Zealand continued to gradually decline in September, QV said in its September report, noting however the data did not include information from the Canterbury area because the earthquake meant there was insufficient sales data to judge values. “The New Zealand housing market is currently experiencing a very low level of sales activity, as has been the case for several months now,” said QV.co.nz Research Director Jonno Ingerson. “The low number of sales is due to some buyers choosing to hold back to see where the market will go, others who are being very cautious in their decision making, and others unable to find suitable properties. There are also some financially secure vendors who are holding out for their desired sale price rather than being tempted by low offers,” Ingerson said. “QV Valuers, particularly in Auckland and Wellington, are reporting that there is a general lack of well presented, quality properties on the market at present. Those that do come up are selling quickly and for good prices. Properties that are not well presented, lacking maintenance, or with perceived flaws are either failing to sell, or buyers are discounting their offers accordingly,” he said. The Canterbury earthquake on September 4 had led to a significant slowdown in house sales across Canterbury, but QV had decided it was unable to publish statistically valid valuation indices for the region for September because of a lack of sales data. The value indices would remain unchanged at August levels, which were 3.2% above the same time last year. Banks, insurance companies and potential buyers are all doing careful due diligence and seeking reassurances over the structural integrity of properties, QV said. This had slowed down the whole sales process, even those which were under contract prior to the earthquake. However there are positive signs of normal market activity now beginning to return, especially in less affected areas of Christchurch, QV said. “The lack of Canterbury data will not have significantly affected the overall New Zealand index as prior to the earthquake values in Christchurch were showing similar trends to the other main urban areas,” said Ingerson. “Looking ahead for the rest of the country, we anticipate that the current trends will continue in the coming months. While the number of new listings is likely to increase through spring and summer we don’t expect sales volumes to increase dramatically,” he said. The average New Zealand sales price over the last three months to September dropped to NZ$401,968 from the NZ$407,900 reported in the three months to August. The average price is unrelated to the QV property valuation indices referred to above, which are based on 'like-for-like' comparisons of sales values of similar houses in similar areas. Values in the Auckland area increased steadily through most of 2009 and early 2010 before falling slightly for a couple of months in April and May, and since then had been relatively stable, QV said. As a result values were still 4.3% above the same time last year but this gap was continuing to close, QV said. In the Wellington area values dropped 2.8% since April and were now only 0.3% above the same time last year. Values in Dunedin had been variable in recent months, but have dropped since March and were now 1.5% above the same time last year. Unlike the other main centres, Hamilton and Tauranga did not see a significant increase in values this time last year. In both cities values have been dropping for most of 2010 and are now below the same time last year by 1.4% in Hamilton and 1.8% in Tauranga. In the provincial centres values have been more or less stable for the past few months and there are signs that values may have increased over the last month in many towns. As a result, values in most of the provincial centres remain above the same time last year, although the gap continues to close. Napier (2.6%), New Plymouth (2.5%), Wanganui (3.0%), Nelson (2.4%), Queenstown (2.6%) and Invercargill (2.3%) all remain above last year. Rotorua (1.3%) and Hastings (0.7%) have values similar to last year, while Whangarei (-2.7%), Gisborne (-0.7%) and Palmerston North (-0.3%) all have values lower than they were a year ago. QV’s Residential Price Index for September shows that property values in the Auckland region are relatively stable, having dropped by only 0.9% since March this year. In contrast, values increased by 5.3% in the 7 months up to March. Consequently, values now sit 4.3% above the same time last year, but 2.6% below the market peak of late 2007. Glenda Whitehead of QV Valuations said; “Activity within the Auckland residential market remains decidedly dull. Interest rates appear not to blame, and as this slow activity perseveres, perhaps we are beginning to see a fundamental change in attitude within the market”. “There is no doubt that with limited likelihood of capital gain in the short and maybe medium term, owners must see the costs of selling an existing property as a real factor. This cost of sale could be the cause of inflexible asking prices, while the likely lack of capital gain is holding down offer levels. Perhaps we have something of a stalemate, with the exception of more motivated vendors. We have also received reports of more vendors selling privately, thus reducing selling costs” Ms. Whitehead said. “Also to note is the impact of the tax changes to the property market. It is still unclear whether these have slowed turnover, or changed the compositional mix of active market participants. Given there is much talk about debt reduction and would-be participants sitting on their hands, this may be a more influential factor than the tax changes themselves. Many of our clients are simply re-financing, confirming this focus on debt reduction” Ms. Whitehead said. “From within Auckland City we have mixed feedback, reflecting the many local and suburb-level trends. In some areas there seems to be a backlog of listings, but contrasting this are reports of a lack of quality family homes on the market. Overall it seems as though buyers continue to lack urgency, probably based on the wider market consensus that it is a buyer’s market. However, some brokers indicate an increasing number of buyers are getting bank pre-approvals, so there could be some pent-up activity in the pipeline” Ms. Whitehead said. “Property values in South Auckland have generally stagnated over the past couple of months. This is reflected by subdued activity and cautious buyers, despite some banks relaxing their lending criteria recently. Investor suburbs like Otara, Mangere, Papatoetoe and Manurewa generally appear to have reasonably good turnover of sales compared to other suburbs. This is in part due to the large presence of mortgagee or forced sales. QV’s registered valuers note that there is an increasing trend of owner/occupier buyers looking at investor suburbs like Manurewa, Otara and Mangere. This may be due to buyers moving into more affordable suburbs; downgrading their expectations to meet their financial circumstances with more negotiation power in forced and mortgagee sales” Ms. Whitehead said. “Within Waitakere City, QV valuers sense a slight lift in market activity over the past fortnight, perhaps due to a shortage of stock in many of the popular suburbs such as Te Atatu Peninsula and New Lynn. First time buyers are noticeably more active now, and a small number of investors are looking at their buying options. There is also more construction occurring in a number of Massey subdivisions. Anecdotally, there appears to be fewer mortgagee sales in this wider area” Ms. Whitehead said. “On the North Shore, values appear stable after downward pressure several months ago. Transaction levels have remained low as many people continue to sit on the side line, and sale times appear to be extending. Mortgagee sales continue to be noted in many suburbs” Ms. Whitehead said. “The market for lifestyle and rural properties in South Auckland continues to be depressed, with properties staying on the market for long periods of time, and sale prices indicating that values continue to slip further” Ms. Whitehead said. QV’s Residential Price Index is calculated using sales data from the 3 months leading up to the month being reported. It is not the same as the average sales price, which fluctuates in line with the mix of properties selling in upper or lower price brackets. The average sales price for the Auckland region in September was $520,862. Glenda Whitehead is a Registered Valuer working with QV in Auckland. QV’s Residential Price Index for September shows that property values in Hamilton are slowly easing. Unlike most other major centres, Hamilton did not experience significant value recovery from mid to late 2009. Subsequently, values are now 1.4% below the same time last year, and 10.9% below the market peak of 2007. Traditionally, the onset of spring and early summer results in a lift in confidence and mood with an associated surge in sales activity and volume. At this stage, there is not yet any indication that activity and values are beginning to recover, instead values up to September continue to slide across the Hamilton residential property market. In the last three months, values appear to be down across the board, but with greater declines in the top half of the market. The lower value brackets of the market have only dropped about 1% during the last 3 months. It is hard to see where the much needed market stimulus is going to come from in the very near future. If the market follows its usual seasonal course, there may be something of a spring uplift before Christmas, but likely at a subdued level. QV’s Residential Price Index is calculated using sales data from the 3 months leading up to the month being reported. It is not the same as the average sales price, which fluctuates in line with the mix of properties selling in upper or lower price brackets. The average sales price for Hamilton in September was $359,800. QV’s Residential Price Index for September shows that property values in Tauranga are easing. Unlike most other major centres, Tauranga did not see significant value gains in 2009. Subsequently, values are now 1.8% below the same time last year, and 11.4% below the market peak of late 2007. Mr. Shayne Donovan-Grammer of QV Valuations said; “It is quite apparent that the Tauranga market is struggling to gain traction. The improving spring weather hasn’t shown any noticeable improvement in terms of activity to date”. “There appears to be a two-tier market emerging. On one hand, sellers who are not in a forced or anxious situation are eventually achieving a sale at a reasonable level. On the other hand, more desperate sellers who need to sell quickly are doing so at heavily discounted prices” Mr. Donovan-Grammer said. “Reality has set in on the market, as buyers realise that the market is not going to get away from them any time soon. They can therefore take their time deliberating over a potential purchase” Mr. Donovan-Grammer said. QV’s Residential Price Index is calculated using sales data from the 3 months leading up to the month being reported. It is not the same as the average sales price, which fluctuates in line with the mix of properties selling in upper or lower price brackets. The average sales price for Tauranga in September was $415,568. Shayne Donovan-Grammer is a Registered Valuer working with QV in Tauranga. QV’s Residential Price Index for September shows that property values in the Wellington region have continued to decrease, by 2.6% since March this year. In contrast, values increased by 3.0% in the 7 months to March. Consequently, values now sit 0.3% above the same time last year, but 5.7% below the market peak of early 2008. Mr. Pieter Geill of QV Valuations said; “Residential property values in greater Wellington have been gradually falling over the last few months. The market is generally characterised by low volumes of sales and a lack of pressure on buyers to commit to the sale process. As such, some believe it is a good time to buy”. “September has continued in much the same way. However, a number our clients are saying that they can’t find a suitable property to buy, and are consequently holding off from buying or selling. Similarly, some agents are saying that they can’t get enough listings for the level of enquiry they are receiving and would love to have more listings. Interestingly, this shortage of stock is not having the affect of holding up values, as it did in winter 2009. Conversely, values have still been sliding, highlighting the recent lack of drive from buyers” Mr. Geill said. “Our registered valuers have noticed less valuation work coming from home buyers, and more work coming from people who are upgrading their existing homes. This indicates that some homeowners are more concerned with paying off debt rather than trading-up the property ladder. This is essentially limiting the available stock for sale and could exacerbate the current situation. We are however also working for some clients who are preparing their properties for sale, as is traditional for spring. It will take some time for these homes to come to market, which could lead to a later than normal spring resurgence. There are early signs that listing numbers are rising and we expect this to continue as the weather improves” Mr. Geill said. The average sales price for the Wellington region in September was $453,023. Pieter Geill is a Registered Valuer working with QV in Wellington. There is currently not enough sales evidence within the Christchurch region to draw conclusions on value trends post-earthquake. QV’s Residential Price Index for August (pre-earthquake) showed that property values in Christchurch had begun to ease for the first time since February, after increasing steadily through 2009. Consequently, values at the end of August sat 3.2% above the same time last year, and 4.7% below the market peak of 2007. Mrs. Melanie Swallow of QV Valuations said; “For the first few weeks post-earthquake, the property market was static as people took stock of things. A month on and signs of normal market activity are beginning to emerge, with an increase in buyer enquiry and demand for quality housing. This is bearing the signs of a seasonal spring market that we were anticipating pre-quake. 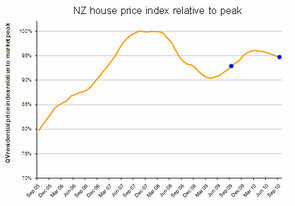 In following the national trend, house prices are still behind their peak levels, although there has been some recovery. It can still be seen as good time to buy or trade up, particularly with prices and mortgage interest rates at their current levels”. “Although we lack enough sales evidence to comment on value trends post-quake, historical evidence from other events in New Zealand, such as the Gisborne earthquake, show that after the initial taking-stock phase, parts of the market where housing stock is not affected tend to carry on” Mrs. Swallow said. “It is taking slightly longer at present to put property deals together in light of additional requirement for dwellings to have post-quake Structural Engineer Reports. Purchasers are also taking more time with their due diligence. However, it is still very positive to see normal market activity resume, with some healthy asking prices being achieved” Mrs. Swallow said. Mr. Tim Gibson of QV Valuations said; “The flat residential property market that has existed over the Dunedin winter period has continued for the month of September. Sales volumes continue to remain low with little evidence of a spring resurgence. However, there are reports of increased interest at open homes during September, which may be a sign of more sales activity in the near future”. “Well presented properties are still selling in reasonable time frames, although those which lack appeal due to deferred maintenance are difficult to shift. This is typical for a subdued residential market, as capital gains obtained from a quick tidy up of a property are not as easy to realise as in past times” Mr. Gibson said. “The market for family homes is the most active part of the wider market, but there have been some reports of greater residential investment activity recently, especially within properties involving student rentals” Mr. Gibson said. “Values still remain 5.6% above the low point in the market measured in March 2009. All areas of Dunedin City are displaying similar levels in their annual value change. This indicates that no suburb or value-bracket is performing any better than another within Dunedin City” Mr. Gibson said. The average sales price for Dunedin in September was $274,112. Pretty soon those YoY figures will be negative. And NZ has predictions of negligable growth figure to come though. Well look on the bright side, in a falling market its easier to upgrade your family home as the financial step-up will be less. As opposed to doing the same in a rising market where you are essentially running the Red Queens race. For godness sake Bernard start using some neutral language instead of transaparently pushing your agenda. It's quite obvious from the data that house prices are UP on a seasonally adjusted basis, but instead you compare current prices arbitrarily against periods that support your "doom and gloom" theory. Reading your editorial each month on the QV report is absolutely pain-staking as you contort your language to deliberately mislead in whichever way most suits you at the time. I'm getting bloody fed up with the disingenuous editorial drivel from this website frankly. Put your money where your mouth is and stop looking at this site Chris if you don't like what it says. Quite frankly I am suprised the figures from QV are not worse than shown above as my colleagues from all over the country say it is getting worse by the month. Buyers are getting more and more aware they have the upper hand.Where I live there are 200 empty rentals on the market instead of the normal 70 on a daily basis. There are a lot of investors in NZ now wishing they had sold in 2007. I don't think QV or anyone really know what is going on except it is bad for vendors and getting worse by the month. When a market is pumped up on debt you could only expect it to reverse the way it is. Property values across New Zealand continue to gradually decline according to the QV residential property indices for September. Odd, isn't it Chris - it reads very much the same as Bernard's piece. You don't think Bernard has infiltrated QV do you? Well said you good thing , Chris ! Stay , and keep sticking it to the man .......... Chicken-Little Hickey . ............ " disingenuous editorial drivel " ........... that's brilliant stuff . Imagine the dreary sycophantic slop that'd be printed here if the likes of you / the Duke / Tribeless-Mark Hubbard / and co. weren't keeping the doomster brigade from sucking up the gloomy mush that Bernard serves them for their 9 a.m. daily feed . GBH.....I know what your up to......now if you want to quit your addiction to the site ...why don't you say so ..instead of looking to be the first to be banned...... you are bored mate...go fish swim do something else for a while......but you gotta know the dealer ain't gonna toss one his best junkies.......p.s. no rum before swim Yeah..? Didn't Bernard ban the Man ? If so , he was the first banned in the new land . And it's no fluke that our dear Duke , departed , broken hearted , about to puke . And now Chris , will not up put with this , off to CNBC .... sheer bliss ! Although I think Chris knows his stuff he come with a bias and that's fair enough. were a a couple of stooges forgive my condescension . You are a class act when the mood takes you.......so you would be the first of consequence. I guess Chris might just have some use - to tell us when we might be getting close to the lows - 'when the last bull turns bearish' as they say. Auckland property market strong. You have to be kidding TCL. I am totally amazed at what lengths the PI's will go to to try and keep it all going. Auckland is going to be like everywhere else in NZ in the end but might just be a bit slower in getting there. Death by a thousand cuts over many years and eventually that will add up to a significant amount downwards and then you add in inflation which a lot of people seem to overlook. There is not one positive economic feature out there at the moment to support property values. What is affecting them the most is the fact that the large majority of New Zelanders are just coping with their daily cost of living expenses and taking on more debt is the last thing they want to do. In fact all they want to do is get rid of what they have as quick as they can. All the debt that was accumulated in the first place to buy all these properties in the mid 2000's has to be dealt with before people will take on any more. ex agent. I'm saying Auckland property is strong in comparison to other investments I could of made at the time. We have 6 rentals all paying for themselves (tenant pays the bulk, LAQC makes up the difference) and in 10 years I will own them all freehold providing a very nice income. My point is that I had had chosen the other investment choices (shares, finance companies etc) the crash would have destoyed my wealth. As things stand, I have no reason to ever sell, no shortage of tenants out there. Property is the best investment I ever, and will ever make. You do not add up TCL. Even if the tenants are paying the bulk you are still making a loss as with an laqc if there is loss you only get back your tax rate so you have to pay the difference which is normally 62c or 67c in the dollar. That is an income loss and with the market going backwards by the month you are also making a capital loss which is growing by the month. And then you say the crash would have destroyed your shares. Just look at Ebos and Abano for example and see how they have grown in the last few years. You should have sold down when the market peaked in 2007 and in fact put some money into some good shares which pay growing dividends and you dont have tenants and expenses. A much better return than pathetic rentals. Where I live normally 70 empty rentals daily .Now 200. Now all you can do is watch your wealth evapourate by the month and that momentum is growing by the day. looks like we'll agree to disagree. For the nominal amount my rentals cost each month, the end game will be six top suburb auckland properties free hold paying for my lifestyle. I agree that 2007 was the time to sell up for a quick gain, but i don't have a crystal ball and I got into property to secure my future. What a lot of renters/ranters on this site don't understand is that for genuine investors, the current market doesn't matter. I won't even consider selling for twenty years, and I almost certainly never will. Oh and empty rentals??? Not in our lifetime mate, my last 2 tenants to move out were filled within a week, rental prices and demand will go up not down. FTB's are screwed both ways for next few years. Maybe they will be, maybe not. It depends on what interesting tax changes come through at the next, the 'after the first term' Budget. Maybe an 80's style Aussie go at 'no negative gearing, at all ?' Sure, it subsequently got reversed. But who knows, in this world of austerity and Government need for tax and other savings. What looks good today, can be a horror story tomorow, as your observation of share trading shows. i'm a typical kiwis i guess, property just makes sense and the results have been fantastic. Agree tax structure might change, but never forget that most powerful decision makers all have big portfolios to protect. One thing is for sure, if i'd starting dabbling in shares and finance companies back then you would probably find me at the city mission by now. FTB's are not screwed TCL. I agree up to 2007 they were but not now. The PI's who did not sell are going to be screwed as residential property values are going to go back to levels a lot of people do not think or rather do not want to think possible. I thought I was going to have to help my kids to buy their first homes but now they like so many others are eleciing to stay home and save while they watch house prices come back by the month. The longer they wait the less they will have to borrow. This is going to take years to pan out. The average New Zealander is just coping with his or her daily costs and all they want to do is get rid of debt and put a little away in savings. The economy is pretty fragile at present and a lot of New Zealanders are worried about keeping their employment. The market was pumped up by debt and promises of wealth. Now it is deflating as people struggle to pay off their property debt and all their cards,hp's and car loans. This has years to run. What we experienced in the mid 2000's was a one off in our life times.it It is time now to sell down and diversify. Assets are not worth anything until they are sold. The way you described your portfolio makes me think you have just made up your circumstances are you do not seem to have a good understanding of negative gearing which only makes sense in a rising market. if the market is going backwards which it is and you are making a loss then you are making an income loss which you need to subsidise and a capital loss. That does not make sense and is not what you would call a good investment. As others have noted, I haven't done much to the QV release, which you can read because I link to it above. My 'spin' is actually the same as QV's. But, of course, you are right. I have a point of view and it does show on occasions. But looks to me like you're a savvy consumer. You know my biases and you can pick out what's useful. But we're always keen to provide plenty of info. This article has more in it, more charts, and our site has more links to useful data than others. Bernard - any chance of showing that data in your graph in an 'inflation adjusted' manner? That would make most interesting viewing. Andy, more interestingly when you compare the median house price to gold, house prices (and incomes for that matter) have been steadily declining in gold price terms for the last decade. Depends if you view gold as money or not. Here ya' go ! Looks like gold was pretty stable to me /NZDL between 2000-05. Given the property market, I'd say that gold did the depreciating over that time. Only the last few years has it got going, compounded by property taking a breather. We wants it my precious, we wants it now (accompanied by noise of slobbering and joint cracking of long slimy fingers). OIC ! ....should have read your first post properly! Bernard is slimmy , since he had his guts girdled ! Yeah- looks far better then you Roger with your 109 kilo, thick glasses and fat beer belly- covering up your willy. Caught me on FaceBook at last ............. So that's where Willy got to ! Get out of there you dirty little mongrel . NO Rogie - I saw you in a “Sauna”- hmmm in Christchurch. I was the tall one, long hooked noise but flat feet, but I didn’t mention my name. NA, look at the 10 year in NZD$ .. gold went from $600/oz (2000) to $1800/oz (2010), a three-fold increase. In the same timeframe house prices approximately doubled. Roughly speaking in 2000, it took 300oz of gold to buy the median priced house, and today approx 200oz. Good idea. We've done it before. We'll update it and I'll put it up tomorrow. Harcourts biggest office in Christchurch was selling 15 properties a week at auction back in August, and have only been selling 1 a week since the quake. So I guess that explains the "lack of data" in Christchurch. I'd hardly describe this rate of sales as "positive signs of normal market activity now beginning to return"
I'm also surprised the data isn't worse and anecdotally, NZers behaviour does not support the doom and gloom scenario. I know it's just one example but recently I looked at a home where the vendors wanted over $700,000 yet it had a 2010 valuation of $410,000. No way did I think the house would go anywhere near $700,00 but it sold for $678,000 - a whopping 40% or so over CURRENT valuation. And it's not the only one in that area, another has just sold and I can guarantee it too went for between 30 and 40% over valuation. The difference between what buyers are actually doing and what commentators say they are doing has never been so wide. What kind of valuation was it? If it was a CV,RV or GV, they aren't a 'valuation' but an arbitrary figure set to assess council rates off. In R/E agent talk " If you pay more than RV, ignore it - it's only rating stuff" or " If you pay less than RV, you must be getting a bargain!" Hooray!! Thank you Nicholas. I am a registered valuer, and get annoyed on a daily basis with the general public confusing what I do with a largely computer generated, and completely unreliable 'Rating Valuation'. Truly admire you persistence NA. Quick squizz at the rates bill shows LV and CV etc with a $ sign in front. I knew someone would probably make the point you have and fair enough, it was a CV - but that's almost beside the larger point which is, without going into a whole lot of boring detail about property prices in this area, that that house sold way over what you might expect in this market and in that area. From what I've seen vendors just love to try it on in the current market. There's a subdivision near me where all the houses are very similar in age and construction etc. and I am often amused at the wide variation in prices that they are advertised at. A three bedroom home in this subdivision can vary in advertised price by more than a hundred thousand dollars. I often wonder if the vendors manage to achieved the massively inflated price, and if they do, whether the buyers are aware that a similar house sold just down the road for 100k less only a few months ago. It happens! I recounted the story a few months back of a developer who wanted to sell one of many propeties he had on his books; so he sold one at 'over the market' to his son, to set the new market price. Needless to say, some followed the Judas goat. Thanks Andy. Yes good point. BH .. using your byline at the head of a re-production of someone else's "Press Release" you do yourself a great dis-service .. surprising are the invective posts .. accusations .. etc etc .. think you need to do better with the attribution .. as an ex-newspaper employee I can tell the difference .. obviously others can't .. wonder if any apologies will be forthcoming .. as a news aggregator you need to be more careful ..
Goddam! Bernard's now even writing the suff.co.nz headlines! Listening to you lot will send poor Bernard into hibernation forever, these prices are only being held because of low sales volumes.After all 5or6 houses selling in the$700,000 to $800,000 range is going to influence the average prices if that is around the $350,000 mark. Farm sales are the ones to worry about, 90% of dairyfarms advertised have no price eg.PBN.expressions of interest, tender etc.Very few sales to compare with, even valuers are tearing their hair out to make a reasonable market assessment. Just because the house price drop is low at present does'nt mean it will not go lower, it will, there are very few buyers out there and they will dictate the price from now on. "Listening to you lot will send poor Bernard into hibernation forever, these prices are only being held because of low sales volumes.After all 5or6 houses selling in the$700,000 to $800,000 range is going to influence the average prices if that is around the $350,000 mark." Which is exactly what happens in the areas I have been monitoring....and strangely enough, these are being sold approx 22% below what they would have fetched 3 yrs ago. Draw a similar situation with the ave weekly income....something like only 5 to 10% of the working population actually earn over the ave.....It certainly doesn't represent the Ave working persons wage does it? Bloomberg calling it rise (at slowest pace)? Hauraki - It's quite simple. They are correctly reporting that prices rose (only just) year on year from September 2009 to September 2010. This reflects that there was some rise between Sept 09 and March 2010, which has nearly been balanced out by the fall since March 2010. But this together with the gains in 2009 before September 2009 have been been minor - thats why we are still 5% below the 2007 peak. OZ employment data is surprisingly good, all they doing extra is mining, which we sometimes not even allowed to consider it. "we probably need to either start mining or get asian investors to eye on our property market..."
Translated: "I bought residential property on the assumption that capital gains would forever make me rich! Rich! RICH! but instead I'm going broke! Broke! BROKE! so now I'm desperately clutching at straws, because being wealthy is my only goal in life." I actually probably concur with your forecast - that matches our inhouse view. Just announced, the Kiwi median income is also down, a bit more than the house prices as it turns out. 1.7% for the year. The median (pre tax) is at $529/week, half of us are earning less than $26k/year. Good luck trying to raise the rent Olly&co. Mean time the top 20% are getting a hefty tax cut. The 20% rise in GST , petrol, food, power, insurances etc is hitting the other 80% hard. Recovery? Fagedaboudit. scary that more than 1/3 receiving benefits. so two figures out today, average household income is $1484/wk, average house price is 402k, roughly 5.2 years of household income. not as bad should I say. I welcome a drop in house prices. Less money going on mortgages and more money going into the local economy. I had to laugh when i heard on National Radio this morning that some CHCH real estate agents were applying for the dole! Why? hehehe, maybe they need a pep talk from Olly ? the average wage in nz is 540.00 approx how does anybody buy the average house i must have gone to the wrong school. It's $529, but it's not average wage - it's medium weekly income, including 33.8% ppl on benefits. median wage is $769, supposedly including part time. median household income is $1236, average household income is $1484. national average house price $402k roughly 5.2 years average household income - which as i said, was not as bad as i anticipated. average wage in nz is insulting,wait for the nxt wave vto aussie can you bl them there will be no real kiwis left just immigrants we want henry in aussie. "The group said an increase in the number of properties on the market, combined with a drop in demand fuelled by uncertainty over the economy, forced prices down 3.6pc"
He must have something to say about all this? "Olly, olly, olly. Oi, Oi, Oi..."
Remind me why NZ commissions are so high? How come vendors think paying for 'marketing' is a good idea when you've got trademe?